It's true 39ers! I’m always seeking more ways to enjoy our youthfulness with att-i-tude. You don’t need to be an “official” member to shop in the new Member section! 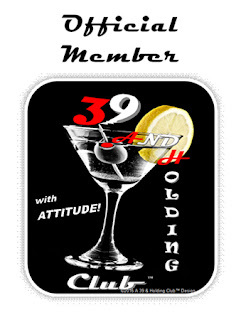 The “Proud Member” design with a Peace symbol and our logo Martini, is for anyone who wants to show the world that they’re proud to be a 39er with att-i-tude! T-shirts, shorts, hats, totes, beer glasses, cups, stuff for the house and even magnets, coasters, clocks, and more, will declare to the world your 39 and Holding pride! *Want to become an “official” card-carrying member of the 39 and Holding Club? Well, now you can – for FREE! Simply shop from one of the “Official Member” product sections (Accessories | Apparel | Home & Office) and after purchase is complete, I will contact you to receive your FREE, laminated, Lifetime Membership card. Curious about the 39 and Holding Club? Come on over to the Join the Club page and see for yourself. I’m forever young – with ATT-I-TUDE – what’s your excuse?! February 39ers ~ What Color is Love?